South Sudan is facing a humanitarian emergency, with nearly five million people suffering from hunger. South Sudan’s conflict with neighboring Sudan is escalating the hunger crisis. Civilians fleeing the fighting are walking for days without food until they can reach aid stations. WFP, the world’s largest hunger fighting agency, is racing to provide aid. One its key partners is the US Food for Peace program, the largest single source of funding for WFP. Congress, though, is planning to reduce funding for Food for Peace and other global hunger fighting programs. The House Appropriations Committee just approved a bill that would cut the Food for Peace program by 22 percent, down to the level of $1.15 billion for the coming fiscal year. Who will this hurt? South Sudan as well as other nations that need food assistance. Diplomatic efforts at demilitarizing the border and resolving the dispute over oil revenues need to be reinforced with food for the hungry. South Sudan’s troubles go far beyond its border areas. The country is facing low food production resulting from drought. Internal conflict between rival tribes has caused large-scale displacement and hunger. WFP warns the crisis may get much worse, “with thousands more refugees expected to arrive in the coming weeks before the rains make the trek across the border impossible.” The agency is currently short $86 million in funding to fight hunger in South Sudan. See also An Independent Nation’s Parallel Path to Lasting Peace. 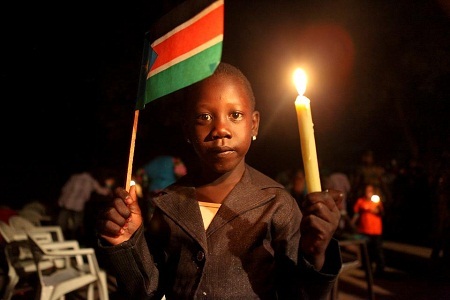 Article first published as Budget Cuts by Congress Would Impact Hungry South Sudan on Blogcritics.